On Monday the committee had its monthly committee meeting, a relaxed occasion ably chaired by Clare, and on this occasion hosted by Sonia with ample drinks and nibbles to sustain us! We agreed final details for the signs which we are having made for our sites around the town, planned publicity etc for Seedy Saturday and finalised the contents of our next newsletter. We also discussed our theme for next year and still had several items of AOB. Even so, we finished well within the two hours which is our limit. 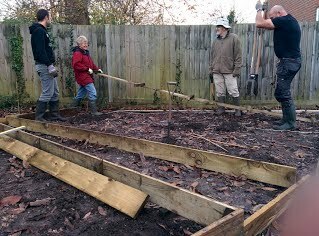 On Wednesday afternoon 6 of us worked at the Vicarage Plot led by Steve, and with his expertise we fixed the wooden planks in position which are to form the edging to the beds and paths. Ann’s design is looking good and she is almost ready to order the soft fruit, strawberries and lavender plants, and organise a planting working party. Look out for details on the front page if you would like to be involved. 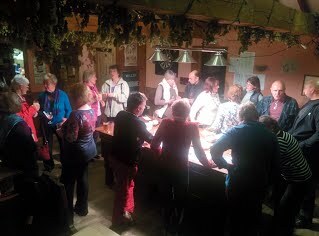 And on Thursday evening we held a social evening at the Railway Arms to say thank you to our volunteers who help us look after our plots and planters, and without whom we would cease to function!